At Camp Bow Wow Duncanville, we believe every dog should have a loving fur-ever home. We work closely with local shelters and rescues to help with their adoption efforts, and often have foster dogs staying at Camp. These dogs get to play all day with other Campers, snooze the night away in individual Cabins, and get lots of love and attention from our Certified Camp Counselors®. Personality: Very social with other dogs, very playful, good with small & large dogs, shy around people but warms up quickly. Easily trainable - knows sit, shake, rides well in a car and crate trained. Would be great with a family! Personality: Meet Duke! 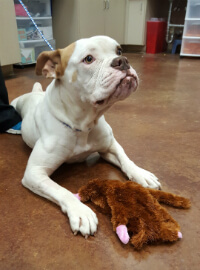 Duke is an American Bulldog and was surrendered to VCA DeSoto because his parents could not care for him. Duke had a blood flow problem in one of his legs and as a result, the leg had to be amputated. Duke is doing so much better now and is looking for his fur-ever home. Duke is neutered, current on all his vaccinations and LOVES TOYS!!! 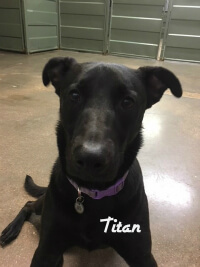 Adoption Information: Shout out for our partner VCA Desoto! If you would like to meet Duke, contact VCA DeSoto.